Accessible Kitchens Individually tailored and inclusively designed to suit the needs of a broad range of users. Leading the way in inclusive design The shower designed to meet the needs of your client, their carers and you. You're in a safe hands Inclusive design & dementia friendly products from the market leader. 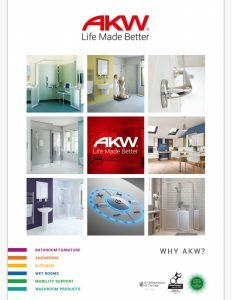 Our range of over 4000 superior quality products supports independent living and brings over 28 years of inclusive design experience to every aspect of showering, kitchens, mobility support, Doc M and Heating. From a small Worcestershire business, AKW have grown to become the UK’s market-leader and an international operation with over 250 members of staff and over 1 million satisfied customers. We’re passionate about supporting independent living with superior quality products that are practical, beautifully designed and which help create stylish living spaces and improve quality. Every one of our products is designed, tested and certified to be the very best. That’s why we can offer a ‘no-quibbles’ return policy and Lifetime Warranties on many of our products so your client can be confident that we’ll always be there to honour it.